"Bad Blood" is a song by American singer-songwriter Taylor Swift, from her fifth studio album 1989 (2014). Swift co-wrote the song with its producers Max Martin and Shellback, with a remixed version featuring additional writing and guest vocals from American rapper Kendrick Lamar. The Lamar version was released by Republic Records on May 17, 2015 as the fourth single from 1989. The lyrics of "Bad Blood" describe betrayal by a close friend. The album version is the eighth track of 1989. The song reached number one in Australia, Canada, Israel, New Zealand, Scotland, and the United States, becoming the third song from 1989 to do so. The accompanying music video was directed by Joseph Kahn and features an ensemble cast. The video previously held the 24-Hour Vevo Record with 20.1 million views, before being surpassed by Adele's "Hello". It won Video of the Year and Best Collaboration at the 2015 MTV Video Music Awards. The song received a nomination for Best Pop Duo/Group Performance while its music video won Best Music Video at the 58th Grammy Awards. "That was about losing a friend… But then people cryptically tweet about what you meant. I never said anything that would point a finger in the specific direction of one specific person, and I can sleep at night knowing that. I knew the song would be assigned to a person, and the easiest mark was someone who I didn't want to be labeled with this song. It was not a song about heartbreak. It was about the loss of friendship." —Swift, behind the meaning of the song and the media's varying perception of the undisclosed person in the song. Swift co-wrote "Bad Blood" about an undisclosed female musician. Swift says the artist attempted to sabotage one of her concert tours by hiring people who worked for her. Publications such as Billboard, Rolling Stone, Time, and The Washington Post have speculated that Katy Perry is the subject of the song. Daniel D'Addario for Time and Emily Yahr for The Washington Post noted parallels between "Bad Blood"'s lyric "If you live like that, you live with ghosts" and "Ghost", a song from Perry's 2013 album Prism. The album version of the song only contains Swift as the vocalist on verses, while the single version features a re-worked instrumental and guest vocals from rapper Kendrick Lamar on verses. Jem Aswad of Billboard felt the song is "reminiscent of Gwen Stefani's "Hollaback Girl". The Guardian's Kitty Empire wrote that the song "faintly recalls Charli XCX with its stark beats." It is written in the key of G major, following a chord progression of C–G–D–Em, and the tempo runs at 85 beats per minute. Swift's vocals in the song span from E3 to E5. The album version received largely negative reviews from critics. Many described the song as "clichéd" while also criticizing its writing, chorus, and production. Entertainment Weekly listed it as one of the best songs on the album. In contrast, the remixed version of the song featuring guest vocals from Kendrick Lamar received acclaim from critics, with praise from music critics directed at Lamar's guest verses and the reworked instrumental. George Seabrook of The Edge awarded the song four and half stars out of five, and called it "glorious" and "intoxicating". He praised the song for "Lamar’s simple, brutally effective verses" and acknowledged the collaboration as "not just one more meaningless stunt collaboration, but a powerful new duo". "Bad Blood" first charted on the US Billboard Hot 100 for two weeks in November 2014 and January 2015 as an album cut from 1989, peaking at number 78. Following the music video premiere at the 2015 Billboard Music Awards, the remixed version of the song featuring Kendrick Lamar re-entered the chart at number 53 and number 26 on the Digital Songs Chart, selling 47,000 digital copies. The following week, the song topped the Billboard Hot 100 on the week ending May 24, 2015, selling 385,000 copies and jumping 52 positions, one of the largest jumps to the top spot in Billboard history. It became her fourth number one single and the third number one from 1989 (following "Shake It Off" and "Blank Space"), making Swift the first artist since Adele to yield three Hot 100 chart toppers from the same album; it is also her fourth consecutive top-10 single from 1989. It also became her 18th top 10 single and Lamar's second (also his first number-one single in the United States). It dropped to number two the week after, being replaced by Wiz Khalifa's "See You Again", where it stayed for five consecutive weeks. It spent another five consecutive weeks at number four, before leaving the top ten of the chart after thirteen consecutive weeks in it on September 5, 2015. By the end of 2015, the song had sold 2,584,000 digital copies in the US, becoming the tenth best selling single of the year. As of November 2017, the song has sold 3.1 million copies in the United States. The music video was directed by Joseph Kahn, who previously directed the music video for the second single from 1989, "Blank Space". The video was filmed in Los Angeles on April 12, 2015, but is set in London. The music video was premiered on May 17, 2015, at the start of the Billboard Music Awards. Each actress chose her character's name. Swift began teasing the video in May on Instagram by posting photos of each character. When her training is complete, Catastrophe and her friends strike out to exact their revenge on Arsyn and her masked henchwomen. The two teams approach each other in what seems to be slow motion while an enormous explosion goes off in the background, blotting out the London skyline, including The Gherkin, and the video ends with both of the women simultaneously striking each other in the face. Rolling Stone described it as a "futuristic neo-noir" video. Daniel D’Addario of Time called it Swift's "most elaborate" music video yet, and compared its visuals to those of Sin City. Slate agreed and found other film inspirations: "Along the way, they pay homage to countless films. Besides the video’s Robocop premise, there’s its Sin City aesthetic, its nod to Tron’s light cycles, and its Kill Bill-like fight in the snow." Billboard drew parallels between the video and the music videos for the Britney Spears songs "Toxic" and "Womanizer", which were both directed by Kahn. The video broke Vevo's 24-hour viewing record by accumulating 20.1 million views in its first day of release, beating the 19.6 million 24-hour record previously held by Nicki Minaj for the music video of her song "Anaconda" in 2014. It was later broken by Adele's "Hello" in October 2015, with 27.7 million views in the first 24 hours. As of February 2019, the video has amassed over 1.2 billion views and was Swift's third video to achieve this milestone. It is in the top 100 most viewed videos on YouTube. "Bad Blood" received eight nominations at the 2015 MTV Video Music Awards. Ultimately, it won Video of the Year and Best Collaboration. It also won the Grammy Award for Best Music Video. Credits adapted from liner notes of 1989. In 2016, the song was used in an Apple commercial which Drake starred in. For their tenth anniversary, How It Should Have Ended released a cover parody video based on "Bad Blood", titled "Bat Blood". Performed by Batman, voiced by show creator Daniel Baxter, the video parodies the marketing of the then-upcoming film Batman v Superman: Dawn of Justice, and uses characters from HISHE's entire history. The lyrics were re-written by Baxter, and the music composed by Bryan English. Anthony Rizzo of the Chicago Cubs used "Bad Blood" as one of his walk-up songs during the team's 2015 and 2016 seasons. The song is also used in both trailers of the 2017 film, The Lego Ninjago Movie. It was also used in a promo for Teen Titans Go! in November of that year. The episode "Demon Prom" of that show has the demon referencing Taylor Swift saying "This is not a Taylor Swift video, this is demon prom". (2015) "Do You Still Love Me?" A cover version of "Bad Blood" was released as the first single from singer-songwriter Ryan Adams' interpretation of Swift's 1989 album, released in September 2015. ^ Molanphy, Chris. "Why Is Taylor Swift and Kendrick Lamar's "Bad Blood" No. 1?". Slate. The Slate Group. Retrieved December 23, 2015. ^ Chuck Klosterman (October 15, 2015). "Taylor Swift on "Bad Blood," Kanye West, and How People Interpret Her Lyrics". GQ. (Advance Publications). Retrieved October 18, 2015. ^ Eells, Josh (September 8, 2014). "Cover Story: The Reinvention of Taylor Swift". Rolling Stone. Retrieved May 10, 2015. ^ Strecker, Erin (September 9, 2014). "Did Katy Perry Confirm Taylor Swift's 'Bad Blood' Song Is About Her?". Billboard. Retrieved May 11, 2015. ^ Drell, Cady (December 31, 2014). "12 Biggest Feuds of 2014: Taylor Swift vs. Katy Perry". Rolling Stone. Retrieved May 11, 2015. ^ a b D'Addario, Daniel (October 27, 2014). "Is Taylor Swift's 'Bad Blood' About Katy Perry? A Textual Analysis". Time. Retrieved May 11, 2015. ^ a b Yahr, Emily (October 27, 2014). "Taylor Swift's 'Bad Blood': How we can tell she's singing about Katy Perry". The Washington Post. Retrieved May 11, 2015. ^ Aswad, Jem (October 24, 2014). "Album Review: Taylor Swift's Pop Curveball Pays Off With '1989'". Billboard. Retrieved May 20, 2015. ^ Empire, Kitty (October 26, 2014). "Taylor Swift: 1989 review – a bold, gossipy confection". The Guardian. Retrieved May 20, 2015. ^ "Taylor Swift 1989 Track by Track Album Review". HitFix.com. Retrieved July 27, 2015. ^ McIndoe, Joe (October 29, 2014). "Track-by-Track Album Review: Taylor Swift - 1989". CultNoise.com. Archived from the original on May 28, 2015. Retrieved July 27, 2015. ^ Diver, Mike (April 11, 2014). "Taylor Swift - 1989". ClashMusic.com. Retrieved July 27, 2015. ^ "Taylor Swift's '1989': Album Review". Daily News. October 23, 2014. ^ Markovitz, Adam (November 11, 2014). "1989: Review". Entertainment Weekly. Retrieved July 27, 2015. ^ Young, Alex (May 17, 2015). "Kendrick Lamar shines in Taylor Swift's "Bad Blood" remix". Consequence of Sound. Retrieved July 27, 2015. ^ "Taylor Swift's 'Bad Blood' video has sound, fury and Kendrick Lamar". Los Angeles Times. May 18, 2015. ^ Seabrook, George (May 20, 2015). 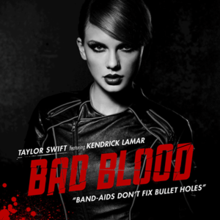 "Review: Taylor Swift ft. Kendrick Lamar – Bad Blood". The Edge. Retrieved May 21, 2015. ^ a b Trust, Gary (May 21, 2015). "Wiz Khalifa Tops Hot 100, Taylor Swift Re-Enters Following BBMAs Video Premiere". Billboard. (Prometheus Global Media). Retrieved May 22, 2015. ^ a b Trust, Gary (May 28, 2015). "Taylor Swift's 'Bad Blood' Blasts to No. 1 on Hot 100". Billboard. (Prometheus Global Media). Retrieved May 28, 2015. ^ Trust, Gary (June 3, 2015). "Wiz Khalifa's 'See You Again' Replaces Taylor Swift at No. 1 on Hot 100". Billboard. Retrieved June 3, 2015. ^ a b Trust, Gary (November 26, 2017). "Ask Billboard: Taylor Swift's Career Album & Song Sales". Retrieved November 26, 2017. ^ "Taylor Swift to Debut 'Bad Blood' Video During 2015 Billboard Music Awards". Billboard. May 7, 2015. Retrieved May 12, 2015. ^ a b "Watch Taylor Swift's Futuristic, Neo-Noir 'Bad Blood' Video". Rolling Stone. May 17, 2015. Retrieved May 18, 2015. ^ D’Addario, Daniel (May 18, 2015). "Watch Taylor Swift's Star-Studded Music Video for 'Bad Blood'". Time. Retrieved May 18, 2015. ^ Shetty, Sharan (May 18, 2015). "Taylor Swift's "Bad Blood" Video Has Enough Celebrities to Be an Actual Movie". Slate. Retrieved May 17, 2015. ^ Strecker, Erin (May 17, 2015). "Taylor Swift's 'Bad Blood' Video: 15 Things We Need To Talk About Right Now". Billboard. Retrieved May 18, 2015. ^ Strecker, Erin (May 21, 2015). "Taylor Swift's 'Bad Blood' Video Breaks Vevo Record". Billboard. (Prometheus Global Media). Retrieved May 21, 2015. ^ "#Hello, 27.7M views in one day! @Adele just snatched the 24 hr record". Twitter. October 26, 2015. Retrieved October 26, 2015. ^ a b "2015 MTV Video Music Awards Nominees Revealed: Taylor Swift, Kendrick Lamar, Ed Sheeran & More". Billboard. Prometheus Global Media. Retrieved July 21, 2015. ^ "Winners of Teen Choice 2015 Announced". Teen Choice Awards. August 16, 2015. Retrieved August 17, 2015. ^ Szalai, Georg. "MTV EMAs: Taylor Swift Leads With 9 Nominations". The Hollywood Reporter. Retrieved September 16, 2015. ^ Blistein, Jon (October 13, 2015). "Taylor Swift, Ed Sheeran, the Weeknd Top AMA Nominations". Rolling Stone. Retrieved May 23, 2017. ^ "About us". UK Music Video Awards. Archived from the original on July 6, 2015. Retrieved July 5, 2015. ^ "Premios Telehit 2015: lista de ganadores completa, ¿cuántos se llevaron One Direction y Taylor Swift?". Archived from the original on December 22, 2015. Retrieved December 16, 2015. ^ "Artistes nominés NRJ Music Awards 2015" (in French). NRJ Music Awards. Archived from the original on December 1, 2015. Retrieved December 16, 2015. ^ "Nominees & Winners". People's Choice Awards. Archived from the original on November 4, 2015. Retrieved November 3, 2015. ^ "Final Nomination List : 58th Grammy Awards" (PDF). Grammy Award. Retrieved December 7, 2015. ^ "Here Are The Nominees For The 2016 Kids' Choice Awards". MTV News. February 2, 2016. Retrieved February 3, 2016. ^ "iHeartRadio Music Awards Announce 2016 Nominees, Performers & New Categories". Billboard. Prometheus Global Media. February 9, 2016. Retrieved February 9, 2016. ^ "2016 ASCAP Pop Music Awards". ASCAP. April 28, 2016. Retrieved April 28, 2016. ^ "Taylor Swift & Justin Bieber Lead Radio Disney Music Awards Nominations". Billboard. March 4, 2016. Archived from the original on March 6, 2016. Retrieved March 5, 2016. ^ "MYXMusicAwards 2016 Winners List". MYX. Archived from the original on August 10, 2016. Retrieved August 6, 2016. ^ "Taylor Swift to Receive First-Ever Taylor Swift Award From BMI". Billboard. April 5, 2016. Archived from the original on April 6, 2016. Retrieved April 5, 2016. ^ a b "Bad Blood (feat. Kendrick Lamar) – Single". iTunes Store (US). Retrieved May 18, 2015. ^ "Apple Music TV Commercial, 'Drake vs. Bench Press' Song by Taylor Swift". iSpot.tv. Retrieved November 26, 2016. ^ Terry, Josh (October 16, 2015). "The Cubs playoff roster ranked according to walk-up songs". www.chicagotribune.com. The Chicago Tribune. Retrieved September 5, 2017. ^ Kerr-Dineen, Luke (May 15, 2016). "The Chicago Cubs roasted a guy who made fun of Anthony Rizzo's walk up music". www.usatoday.com. USA Today. Retrieved September 5, 2017. ^ "Australian-charts.com – Taylor Swift feat. Kendrick Lamar – Bad Blood". ARIA Top 50 Singles. Retrieved 30 May 2015. ^ "Austriancharts.at – Taylor Swift feat. Kendrick Lamar – Bad Blood" (in German). Ö3 Austria Top 40. Retrieved 27 May 2015. ^ "Ultratop.be – Taylor Swift feat. Kendrick Lamar – Bad Blood" (in Dutch). Ultratop 50. Retrieved 22 May 2015. ^ "Ultratop.be – Taylor Swift feat. Kendrick Lamar – Bad Blood" (in French). Ultratop 50. Retrieved 22 May 2015. ^ "Top 100 Billboard Brasil - weekly". Billboard Brasil. July 6, 2015. Archived from the original on July 13, 2015. Retrieved July 12, 2015. ^ "Taylor Swift Chart History (Canadian Hot 100)". Billboard. Retrieved May 12, 2015. ^ "Taylor Swift Chart History (Canada AC)". Billboard. Retrieved July 18, 2015. ^ "Taylor Swift Chart History (Canada CHR/Top 40)". Billboard. Retrieved July 11, 2015. ^ "Taylor Swift Chart History (Canada Hot AC)". Billboard. Retrieved July 18, 2015. ^ "ČNS IFPI" (in Czech). Hitparáda – Radio Top 100 Oficiální. IFPI Czech Republic. Note: Change the chart to CZ – RADIO – TOP 100 and insert 201523 into search. Retrieved 15 June 2015. ^ "Taylor Swift – Chart history" Billboard Euro Digital Songs for Taylor Swift. Retrieved May 28, 2015. ^ "Taylor Swift: Bad Blood (Feat. Kendrick Lamar)" (in Finnish). Musiikkituottajat – IFPI Finland. Retrieved June 4, 2015. ^ "Lescharts.com – Taylor Swift – Bad Blood" (in French). Les classement single. Retrieved May 30, 2015. ^ "Offiziellecharts.de – Taylor Swift feat. Kendrick Lamar – Bad Blood". GfK Entertainment Charts. Retrieved 22 May 2015. ^ "Archívum – Slágerlisták – MAHASZ" (in Hungarian). Single (track) Top 40 lista. Magyar Hanglemezkiadók Szövetsége. Retrieved May 28, 2015. ^ "Chart Track: Week 22, 2015". Irish Singles Chart. Retrieved May 19, 2015. ^ "Top Digital - Classifica settimanale WK 21 (dal 2015-05-18 al 2015-05-24)". Federazione Industria Musicale Italiana. Retrieved September 25, 2015. ^ "מדיה פורסט - לדעת שאתה באוויר". Mediaforest.biz. Archived from the original on September 1, 2015. Retrieved July 25, 2015. ^ "Taylor Swift Chart History (Japan Hot 100)". Billboard. Retrieved June 15, 2015. ^ "The official lebanese Top 20 - Taylor Swift". The official lebanese Top 20. ^ "Nederlandse Top 40 – Taylor Swift feat. Kendrick Lamar" (in Dutch). Dutch Top 40. Retrieved 22 May 2015. ^ "Charts.nz – Taylor Swift feat. Kendrick Lamar – Bad Blood". Top 40 Singles. Retrieved 22 May 2015. ^ "Official Scottish Singles Sales Chart Top 100". Official Charts Company. Retrieved May 24, 2015. ^ "ČNS IFPI" (in Slovak). Hitparáda – Radio Top 100 Oficiálna. IFPI Czech Republic. Note: insert 201523 into search. Retrieved 15 June 2015. ^ "EMA Top 10 Airplay: Week Ending 2015-07-28". Entertainment Monitoring Africa. Retrieved July 30, 2015. ^ "Spanishcharts.com – Taylor Swift feat. Kendrick Lamar – Bad Blood" Canciones Top 50. Retrieved May 24, 2015. ^ "Swisscharts.com – Taylor Swift feat. Kendrick Lamar – Bad Blood". Swiss Singles Chart. Retrieved May 24, 2015. ^ "Official Singles Chart Top 100". Official Charts Company. Retrieved May 24, 2015. ^ "Taylor Swift Chart History (Hot 100)". Billboard. Retrieved May 27, 2015. ^ "Taylor Swift Chart History (Adult Contemporary)". Billboard. Retrieved August 25, 2015. ^ "Taylor Swift Chart History (Adult Pop Songs)". Billboard. Retrieved July 14, 2015. ^ "Taylor Swift Chart History (Dance Mix/Show Airplay)". Billboard. Retrieved July 2, 2015. ^ "Taylor Swift Chart History (Dance Club Songs)". Billboard. Retrieved July 21, 2015. ^ "Taylor Swift Chart History (Pop Songs)". Billboard. Retrieved June 25, 2015. ^ "Taylor Swift Chart History (Rhythmic)". Billboard. Retrieved August 4, 2015. ^ "Radio Disney - Year End Charts - Top 50 Songs of 2015". Disney. Retrieved January 2, 2016. ^ "ARIA Charts - End of Year Charts - Top 100 Singles 2015". Australian Recording Industry Association. Archived from the original on January 24, 2016. Retrieved January 6, 2016. ^ "Canadian Hot 100 Year End 2015". Billboard. Prometheus Global Media. Retrieved December 9, 2015. ^ "End of Year Singles Chart Top 100 - 2015". Retrieved January 5, 2016. ^ "Adult Contemporary Songs Year End 2015". Billboard. Prometheus Global Media. Retrieved December 9, 2015. ^ "Adult Pop Songs Year End 2015". Billboard. Prometheus Media Group. Retrieved December 9, 2015. ^ "Dance/Mix Show Songs Year End 2015". Billboard. Retrieved August 25, 2016. ^ "Pop Songs Year End 2015". Billboard. Prometheus Media Group. Retrieved December 9, 2015. ^ "Rhythmic Songs Year End 2015". Billboard. Retrieved August 25, 2016. ^ "As 100 Mais Tocadas nas Rádios Jovens em 2016". Billboard Brasil (in Portuguese). January 4, 2017. Retrieved September 7, 2017. ^ Ryan, Gavin (December 5, 2015). "ARIA Singles: Adele 'Hello' Spends Sixth Week at No 1". Noise11. Retrieved December 5, 2015. ^ "Canadian single certifications – Taylor Swift – Bad Blood". Music Canada. Retrieved December 1, 2015. ^ "New Zealand single certifications – Taylor Swift feat. Kendrick Lamar – Bad Blood". Recorded Music NZ. Retrieved June 12, 2015. ^ "British single certifications – Taylor Swift – Bad Blood". British Phonographic Industry. Retrieved January 8, 2017. Select singles in the Format field. Select Gold in the Certification field. Type Bad Blood in the "Search BPI Awards" field and then press Enter. ^ "American single certifications – Taylor Swift – Bad Blood". Recording Industry Association of America. Retrieved March 2, 2017. If necessary, click Advanced, then click Format, then select Single, then click SEARCH. ^ "RIAA Adds Digital Streams To Historic Gold & Platinum Awards". Recording Industry Association of America. May 9, 2013. Archived from the original on October 19, 2014. Retrieved October 19, 2015. ^ "Top 40/M Future Releases". All Access. Archived from the original on May 18, 2015. ^ "Taylor Swift - Bad Blood (Radio Date: 12-06-2015)". EarOne. ^ "TAYLOR SWIFT "Bad Blood (feat. Kendrick Lamar)" - (Radio Date: 12/06/2015)". radioairplay.fm. ^ "Ultratop.be – Ryan Adams – Bad Blood" (in French). Ultratop 50. Retrieved 6 November 2018. ^ "Ryan Adams Chart History (Rock Airplay)". Billboard. Retrieved 19 February 2016.